Anne Frank Center blasted with hate mail after asking Tim Allen to apologize for a terrible analogy. 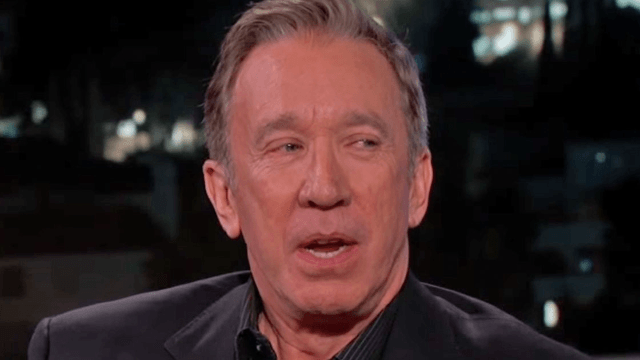 Speaking with Jimmy Kimmel on Friday, Tim Allen compared being a conservative in Hollywood to being a Jew in Nazi Germany. "You've gotta be real careful around here," said Tim Allen, coming this close to ruining Toy Story forever. "You get beat up if you don't believe what everybody believes. This is like '30s Germany." I have relatives who would argue this point w/Mr. Allen, however they didn't make it out of 1930's Germany alive. The immediate backlash was swift, obviously, and the comment made its way all the way to the Anne Frank Center, a U.S. organization that promotes social justice in the name of the teenage German-Jewish victim of the holocaust. While Tim Allen has yet to respond to the rebuke, the Anne Frank Center reported a swift backlash to their statement—from angry Tim Allen fans who are also anti-Semitic. WHAT HAPPENED AFTER WE TOOK ISSUE YESTERDAY WITH TIM ALLEN'S OFFENSIVE COMPARISON OF THE MOVIE INDUSTRY TO 1930s NAZI GERMANY? 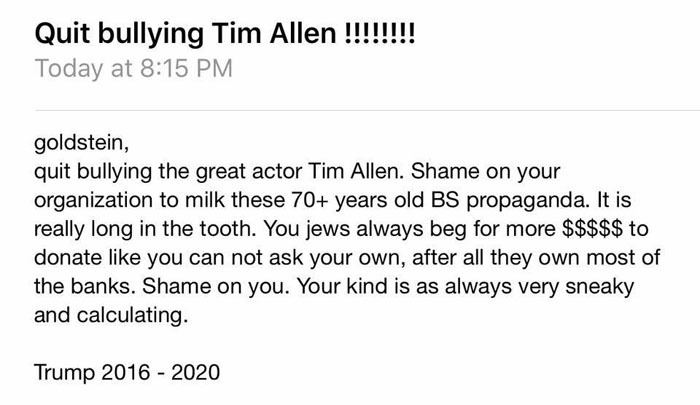 A number of Tim Allen fans sent us emails filled with Antisemitic stereotypes and attacks that evoke the deep-seated hatred we Jews have faced for millennia. The hate follows us with intensity no matter where in the global diaspora we've lived - except in history's most Jewish-embracing superpower, the United States, and in Canada and sadly too few other places. But the unimaginable is spreading in America. Too many Jewish Americans are facing hate we never thought possible. So if any of you believe the Anne Frank Center for Mutual Respect comes on too strongly in fighting hate, whether in our organization's equally prioritized fights against Antisemitism and the hate targeting other communities, we disagree. History has taught us the consquences of appeasing hate. Our organization's responsibility is to be an early warning system of prejudice that sounds an alarm early and loudly enough for the nation to hear, especially because we have a federal government that doesn't sound the alarm as it used to. As for you, Tim Allen, we say this: Look at this email to our organization, reflecting others like it, that's the consquence of your comparing Hollywood with Nazi Germany. Emails such as this demand our sounding the alarm until you heed it. Will you now see the consquences of your statement? Will you now retract and apologize for your statement, and replace it with a message of love you should speak publicly to haters like this? Help us to stop #Antisemitism early so that #NeverAgain never escalates to the unimaginable ever again. The "great actor"? Talk about BS propaganda.